A good start in the morning often establishes the mood for the rest of the day. 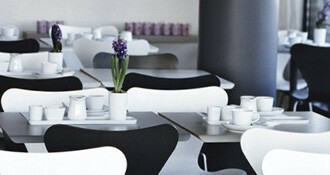 In our generously sized breakfast rooms, guests can enjoy a healthy breakfast in a bright, airy atmosphere. The wide, nearly continuous front windows can be opened to access the patio where you can enjoy the heavenly view across the rooftops of Berlin. Our breakfast buffet offers a contemporary selection of fresh and light delicacies tended to by our friendly attentive staff. 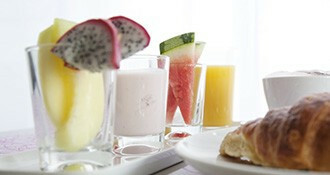 From croissants to various fruits and cereals to fresh yoghurt-glasses – we have something for everybody available. 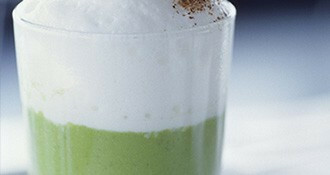 Naturally, this also includes many types of coffee drinks. For guests on a fly, we also offer quick breakfasts to go so that you start off the day on the right foot!